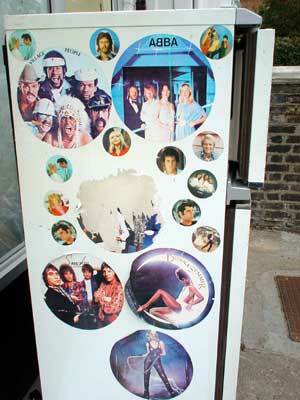 This old fridge is like a slice of pop history, with a collection of stickers freezing (sorry!) the mid 1970s charts. Featured on the fridge are Smokie, Donna Summer, David Soul, Abba, Bee Gees, John Travolta, Village People, Boney M - and a sole concession to new wave, Blondie.